My girlfriend is taking an accounting course that requires installing Microsoft SQL Server database software on her personal computer. In short, there were a lot of problems. It was such an ordeal that I am chronicling it here. This is installing SQL Server 2008 Express on Windows XP SP2 Chinese (PRC). Fix needed: You can not install this under the default Administrator account. Create a new admin-level user account, login to it, and install from there. After doing this, you will lose access to the Administrator account. Actually it is not gone, just hidden (you can see it in Safe Mode). Fix optional: To restore it so it always shows up, follow the instructions here. Then you will be able to choose Administrator from the list of accounts on the Welcome Screen when you boot up Windows. Install asks to browse for installation media when installing from the DVD. Fix: Copy the folder “sql2008exp32” (for Windows 32 bit version) from the DVD to the Desktop, and running the file “setupsql2008exp” directly from the downloaded copy on the Desktop. Validation errors at Server Configuration. Empty Account Name and Password. I don’t know why the install left it blank. But I just copied the account name from my own working installation of SQL Server 2008 R2. Setup process complete – Failed Failed Failed. and then rerun SQL Server Setup. There are 2 links we can look at. First, the Exception help link — the advice is wrong. Ignore it. 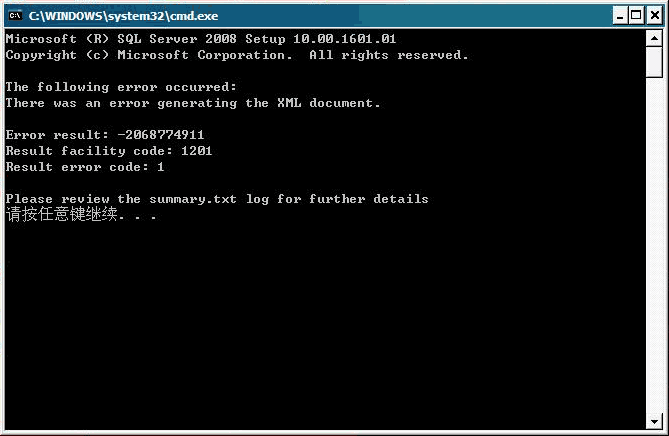 The log with failure tells us what is really going on — an error installing MS XML 6.0. Search on the web, and find this problem is documented at Microsoft (KB 968749: SQL Server 2005 setup fails when MSXML Core Services 6.0 Service Pack 2 has already been installed), though if you try to follow their instructions, you’ll find the Windows Installer CleanUp utility can not be downloaded! It was removed because it was causing more problems! Fix needed: Manually uninstall MS XML 6.0 from Control Panel. 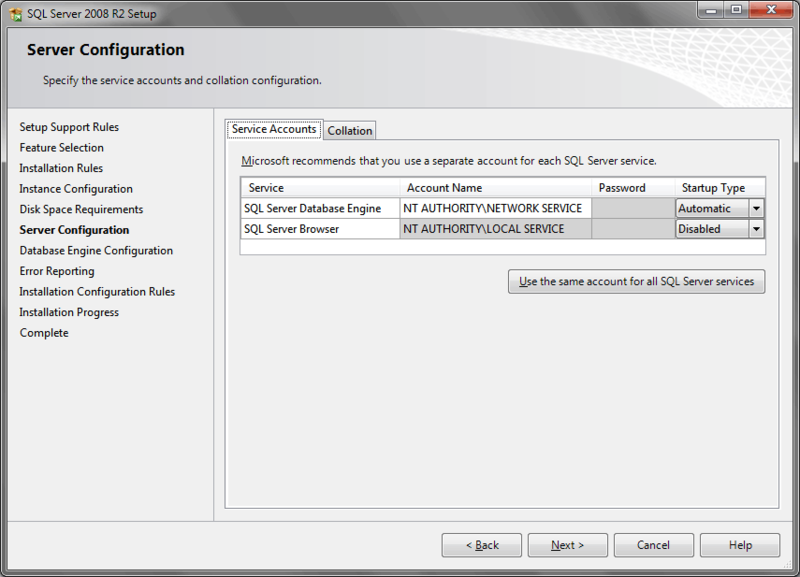 Finally, we are able to install SQL Server 2008! The ordeal is over right? No! Cannot connect to database. Turns out the installation instructions we followed were insufficient. When we installed SQL Server, we were supposed to use a specific database instance name and password, instead of the default SQLEXPRESS instance. Fix: Run installation again, choose Add a New Instance. Of course, that just made problem #5 show up again, so we had to “re-uninstall” MS XML 6. Yes, I made that word up to reflect the absurdity of the situation. Eventually choose Mixed Mode authentication and give the password. Five days later, it is finally done. Wow. Microsoft should be ashamed. Hope this helps someone. Setting up Remote Assistance. This is not easy at all. Damn you Microsoft. Giving passwordless Administrator a password. Did not work. Run as Administrator. This is not necessary for Windows XP and a red herring. (It is needed for Vista and later). Installing Windows Updates (computer has SP2 only). Adding Administrator account to Debug Programs privileges. Did not try because could not figure out Chinese translation of “Debug Programs” (Windows language is Chinese PRC). Installing SQL Server 2008 R2 instead. (Actually it probably would have worked, but at the time, didn’t realize the solution to the validation errors). « IMmerge 1.0 Beta 1 Released!